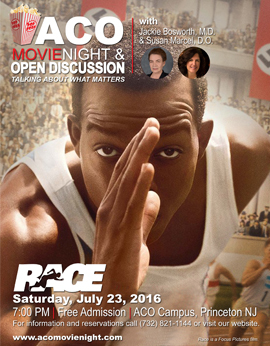 ACO Movie Night & Open Discussion featuring Race - with Jackie Bosworth, M.D. and Susan Marcel, D.O. Race is based on the incredible true story of Jesse Owens (played by Stephan James), the legendary black American athlete whose quest to achieve Olympic greatness thrusts him onto the world stage of the 1936 Olympics. There he faces off against Adolf Hitler’s vision of Aryan supremacy. Race is an enthralling film about courage, determination, tolerance, and friendship, and one man’s fight to attain his place in Olympic history. Join us as we explore and discuss the film’s moving depiction of the healthy and unhealthy cultural, social and personal forces that were in play 80 years ago and that are still active today.